This page will help you create references in Zotero yourself. 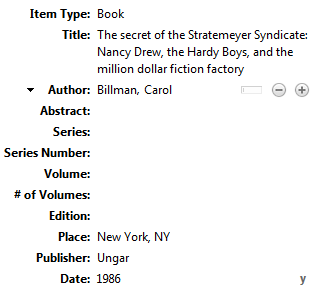 This will allow you to insert references for any sources you already have on hand. 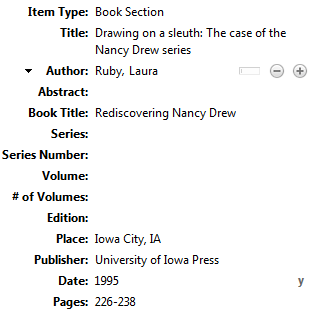 To manually add a reference to a full book, click the New Item button and choose "Book." 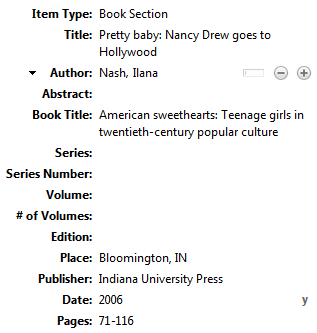 Then fill in the fields relevant to your book, following the capitalization standards of your citation style. 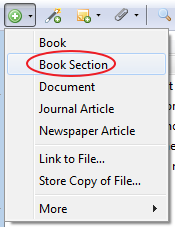 To manually add a reference to a chapter or article in a book, click the New Item button and choose "Book Section." Fill in the fields relevant to the chapter, observing the capitalization standards of your citation style. Note that the “Title” field refers to the chapter title. Fill in the fields relevant to the chapter, observing the capitalization standards of your citation style. 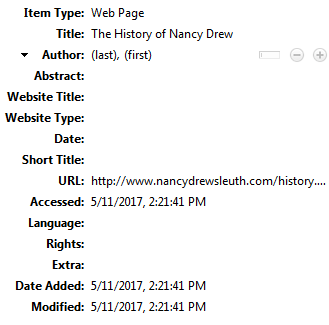 Note that the “Title” field refers to the article or chapter title, and the "Author" field refers to the article or chapter author(s). 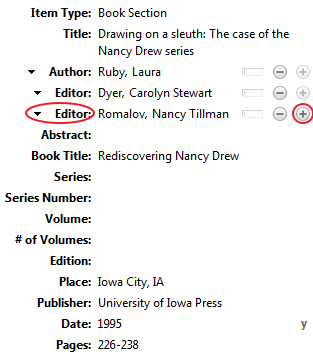 To insert the name of the book's editor(s), click the plus sign next to the “Author” field. In the new author field that appears, click the carat next to “Author” and change it to “Editor,” and enter the editor’s name. Repeat this process if the book has multiple editors, or if the article or chapter has multiple authors. 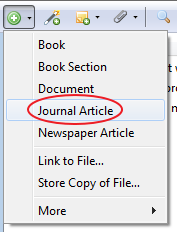 To manually add a reference to a journal article, click the New Item button (a plus sign in a green circle), and choose "Journal Article." 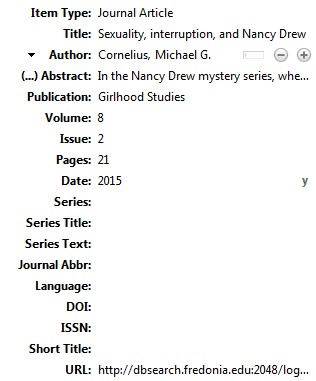 Note that the “Title” field refers to the article title, while the “Publication” field refers to the journal title. If the article has multiple authors, click the plus sign next to the "Author" field to add additional fields. 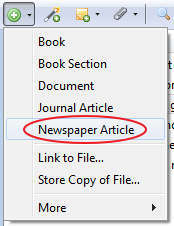 To manually add a reference to a newspaper article, click the New Item button and choose "Newspaper Article." 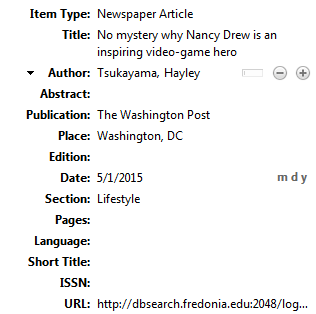 Fill in the fields relevant to the article, observing the capitalization standards of your citation style. To add a reference to a web page, ensure the Zotero desktop app is open. 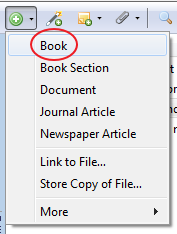 Then click the Zotero Connector button in your browser's toolbar. 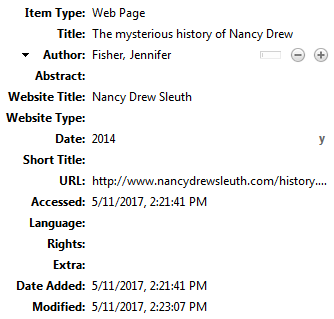 After a moment, Zotero will automatically generate a record for the item and attach a snapshot of the page as it appeared when you captured it. However, Zotero's record will almost certainly be missing information. Review the web page and fill in any missing information, such as the author, the website title, and the date the page was created or last edited. Also, check that the automatically generated fields are correct and are capitalized correctly according to your citation style.